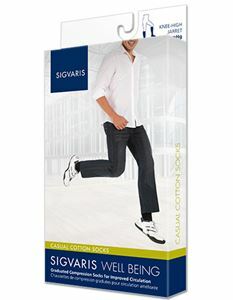 Casual Cotton by Sigvaris is designed especially for Men to provide extra protection and comfort. Perfect to use on aching and tiring legs. Made up of Supima cotton. Available in Black, White, Khaki, Navy and Brown. Excellent for people with skin-sensitivities. Available in three sizes; A, B, and C.